The New York Times reported that the Pope has sanctioned the use of condoms to help stop the spread of AIDS. How about that Pope! What a MODERN GUY. Don’t get him wrong; the Catlick church still condemns condoms (and all other methods of birth control) as SINFUL, but this is a tectonic shift in attitude. Just last year while en route to AIDS-plagued Africa, he said that condom use did not help prevent the spread of AIDS. Only abstinence and fidelity did. Go Pope! Every time that guy opens his yap I pull further away. 98% of the Catholics I know are Chinese menu Catholics. That is to say, they’ll pick and choose certain dictates to follow but they won’t embrace Vatican laws and regulations as a whole. Even my dear old mother still took communion though as a twice-divorced woman it was against holy doctrine for her to do so. I think that if every Catlick had to choose between following Vatican dogma to the letter of the law and leaving the church, there would be a stampede to the exits. I feel kind of guilty picking on the Pope. It’s like shooting fish in a barrel. In my latest column for the UndiePress (Have you read it yet? It’s genius!) I discuss the difference between a signed book, an inscribed book and an association copy. Here’s a perfect example of a great association copy that’s going to be auctioned at Bonhams in New York on December 9th. INSCRIBED TO ROBERT F. KENNEDY. The Spy Who Loved Me. London: Jonathan Cape, . First edition, signed and inscribed by Fleming to Robert F. Kennedy on the front free endpaper. Provenance: the estate of Paul “Red” Fay [1918-2009], a close family friend of the Kennedy’s and advisor to JFK. Wasn’t it an Italian mother of many who shouted at a St Peters,Rome appearance: “If you don’t playa-da game, you don’t make-a da rules!”Are you going to bid for the Fleming? MIT: I’m going to bid on that book IN MY DREAMS. God, if only I had invented those damn silly bandz all the cook kids are wearing I could bit on it for real.Daisy: Very good example of merging two unrelated topics in one post. You’re a Gold Star commenter. Pope? Schmope!Hey, I’m Jewish already? I’m about as far from religious as you can get. Religious dogma only makes sense if you are trying to keep people blind and faithful and uneducated. It’s a control issue. I’m really not one who likes to be controlled…I had to laugh out loud at daisyfae’s comment, though!!! That’s a good one!!! 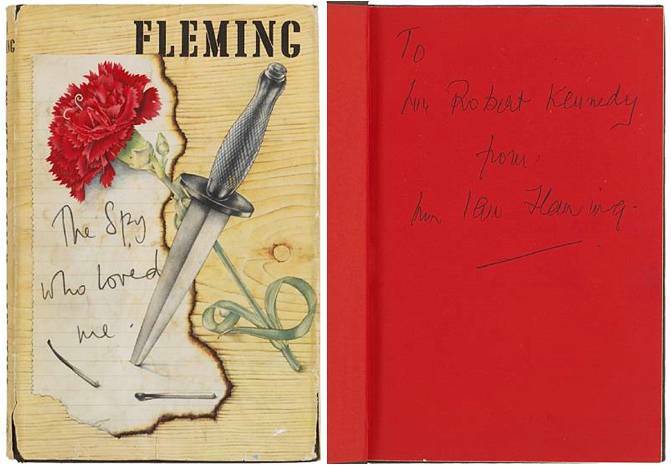 Odd that the inscription is so impersonal but then I suppose Fleming was one cool customer. Map: English + Gaelic + Hebrew? You’re a well rounded individual.Ponita: They tried when I was younger but the teachings just never seemed to get under my skin (much to my mother’s dismay).Pat: Fleming did NOT like to sign books so anything with his signature sells at a premium price. I’ve seen books that were simply signed “Ian” sell for thousands. The Popemobile looks more like a fishtank to me. To my knowledge the Catholic Church has not made it official doctrine that AIDS is a scourge brought by God upon an unrighteous and sinful people…..that accolade can be given to our friends of P. Robertson and those Absolutely Fabulous Evangelical Protestants. While I would not count myself as practicing, but I prefer the overall Catholic ‘method’ to transcendence than any Protestant faith can offer….if we’re limiting ourselves to Christianity, that is…. kykn: It’s probably best not link the pope’s name and shooting in any way. What if they’re right about all that God stuff? !Ellie: Baby steps. Remember, the use to burn heretics. They got past that, they’ll get past condoms. JZ: Another excellent point. Fortunately, we have a few alternatives to Catholicism. Like Buddhism. And Rastafarianism. I won’t comment on the majority of the blog…for reasons that you know.But I will say this. Shooting fish in a barrel is a lot harder than you think. The Mythbusters say so. Hey — I tried the UndieWare link thingy, but I got 404ed, ’cause I wasn’t cool enough or something.Does one need the secret handshake? Blaiser: Hi! The link worked for me! Are you using some obscure browser prototype beta?